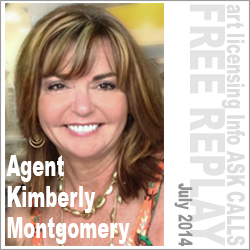 Having been an experienced and successful licensed artist herself, Kimberly now owns Montage Licensing, where she represents artists to manufacturers. Montage Licensing is a premier illustrative art licensing firm owned and operated by an artist with over 25 years in the industry, and knows what manufacturers are looking for in both art opportunities and mutually beneficial contracts. Kimberly shares her thoughts on all aspects of working with an agent – the benefits, artists using social media, portfolio size, agency exclusivity, agent compensation, what she looks for in a potential client, and what someone looking for an agent should do . . . and NOT do!